Stunningly awful Anthony Steffen vehicle that attempts to maul the plots of The Tramplers, 1965 by way of The Hellbenders, 1967 with a stop over into The Good, The Bad and The Ugly, 1966 territory. A Confederate major searches for a hidden cache of Union gold in an effort to jump start the war again. Only Shango, a prisoner of war, knows its location. A gang of Mexican banditos are also after the gold and they team up with the devious major to find the riches. Unfortunately, Shango escapes and hides out in a poverty stricken village. The villains take over the town till the inhabitants hand over Shango. Someone needed to find some gold to fund a better script than what star Steffen and director Mulargia were able to wrangle between them. First the major needs Shango to find the loot, then later wants him dead and the money is never mentioned again nor is it ever found! This hidden Union war chest was supposed to be the centerpiece by which the main characters revolved, but apparently a Civil War of sorts was raging behind the scenes. Steffen is incredibly weak here as the hero. He's either being captured, or escaping only to be captured again a short time later. The "action" scenes consist of Super Steffen rapidly firing his gun, the only one in existence that fires a hundred bullets without reloading, as half a dozen extras spin and twirl before hitting the ground. After a few scenes like this, it quickly becomes tiresome and a lazy excuse for choreographing the action. At one point, Shango fires straight ahead, but somehow manages to kill enemies lurking in trees. 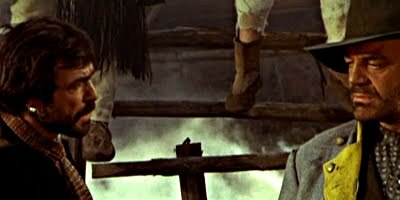 Fajardo tries to carry the film as the villain doing his best to be nasty by gunning down women and children, but these scenes are just as lazily photographed. Arguably the worst of the Django sounding titles akin to the likes of Cjamango and Garringo.